In our previous Then vs. Now blog posts, we have discussed why the Ford’s stage is slanted and where the cheapest seats were during 1860s performances. Today we take look at the most expensive seats in the house—the ones that the Lincoln family knew best. During Lincoln’s presidency, Ford’s Theatre contained eight box seats, four on either side of the theatre. The four upper boxes overlooked the stage and offered significantly better views than the four below. As a result, a ticket for the upper boxes cost $10 each while the lower boxes cost $6. These box seats offered separation from the general audience, but they also gave those seated in the orchestra and dress circle a view of the boxes’ occupants. For theatre owners then (and now), having high-ranking government officials visit the theatre was an additional attraction for general audiences. In fact, when he learned that Lincoln would attend his theater the evening of April 14, owner John T. Ford wrote a notice that appeared in the day’s papers and printed new handbills with the information for distribution to the public. Presidential visits were hardly secret—they were a major reason for Washington locals—and soldiers passing through—to attend the theatre. Government officials also visit Ford’s Theatre today, but for security reasons, their visits often are not publicly announced. A view into the audience at Ford's Theatre from the Presidential Box. Photo copyright Maxwell MacKenzie. While the upper-tier theatre boxes were more expensive than other seats, the Presidential Box (sometimes called the State Box) was a special space that John T. Ford created whenever high-ranking officials came to see a performance. 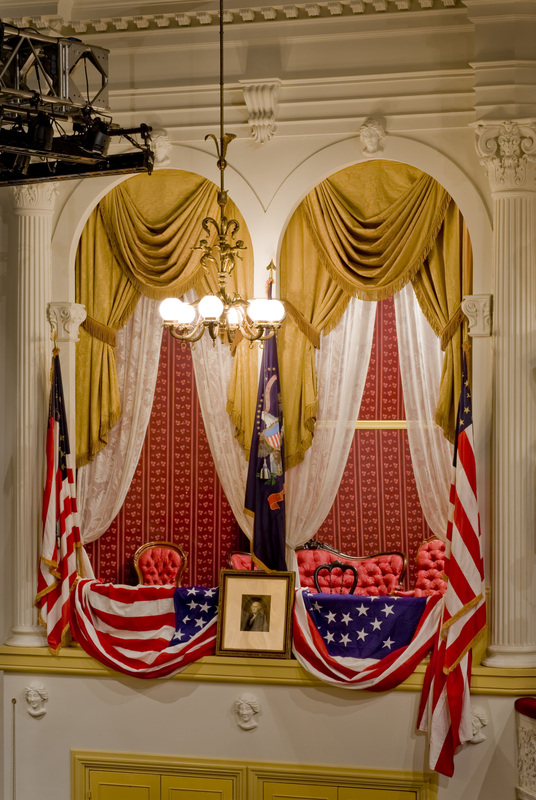 To create the Presidential Box, theatre employees removed the partition separating boxes Seven and Eight to form a larger seating area for the Presidential party. 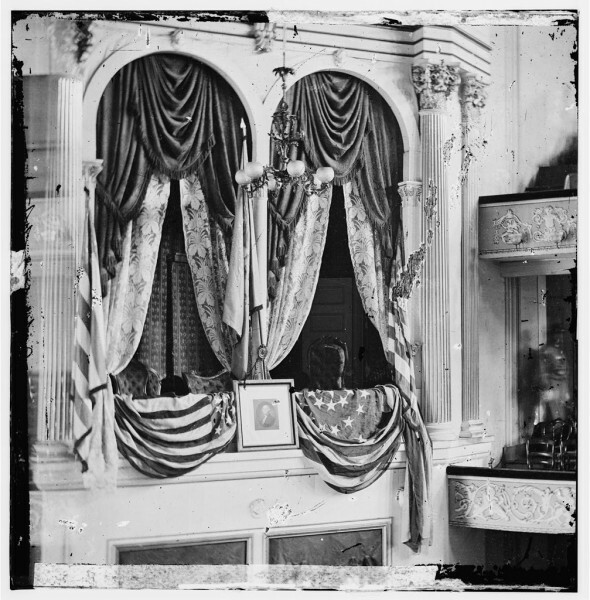 When the President came to visit, flags were draped across the box and a lithographed portrait of George Washington was placed in front of the box railing. The portrait functioned as the 19th-century equivalent of a Presidential Seal, which didn’t exist in its current form until 1945. 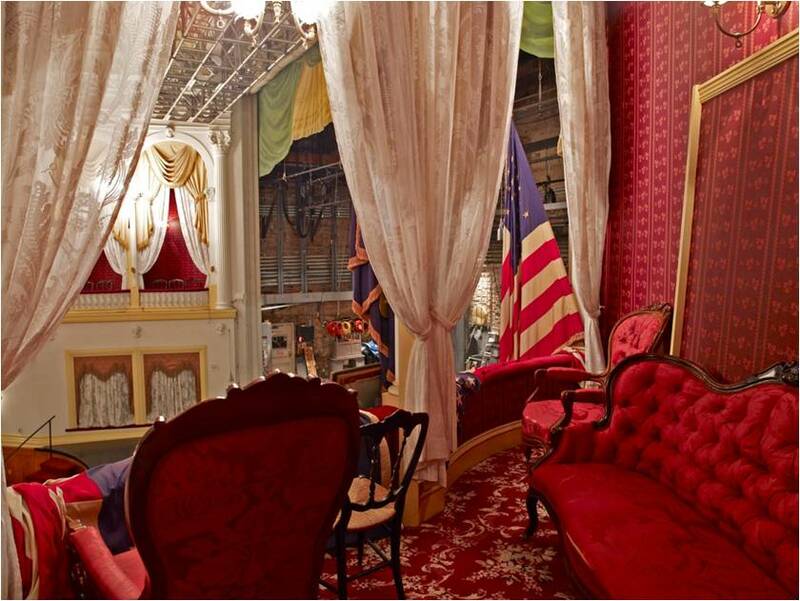 To furnish the box, theatre staff added a velvet-covered sofa and cane chairs. On the evening of the assassination, a walnut rocker was added to the box. This rocker came from the personal lodgings of Harry Ford on the third floor of the Star Saloon. Photo of the Presidential Box today. Image copyright Maxwell MacKenzie. When patrons tour Ford’s Theatre today, they often wonder if they can sit where Lincoln once sat. Today, the Presidential Box is a museum space of its own, and none of the other theatre boxes are used for event seating either. Todd Gearhart and Susan Heyward on set of the Ford’s Theatre production of Samuel A. Taylor’s "Sabrina Fair," directed by Stephen Rayne in fall 2010. Photo by T. Charles Erickson. 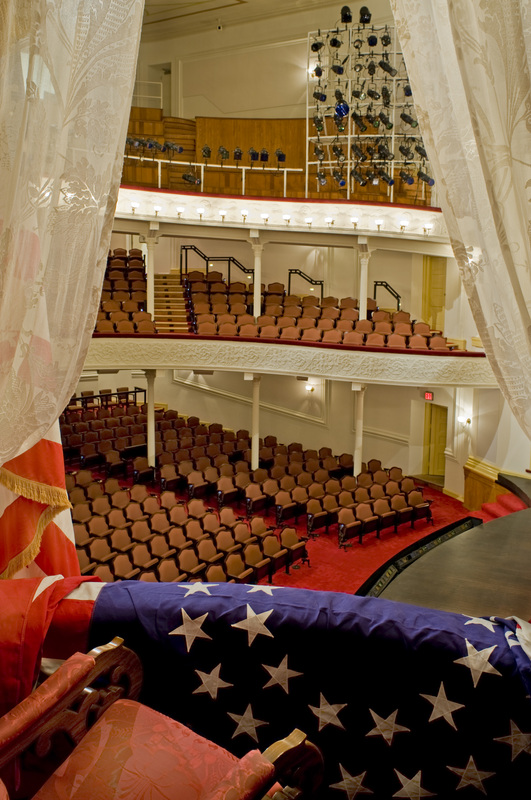 When modern presidents visit Ford’s Theatre for special events, they typically sit in the first rows of seats on the orchestra level. We still present plays at Ford’s Theatre to honor the art that Lincoln loved. 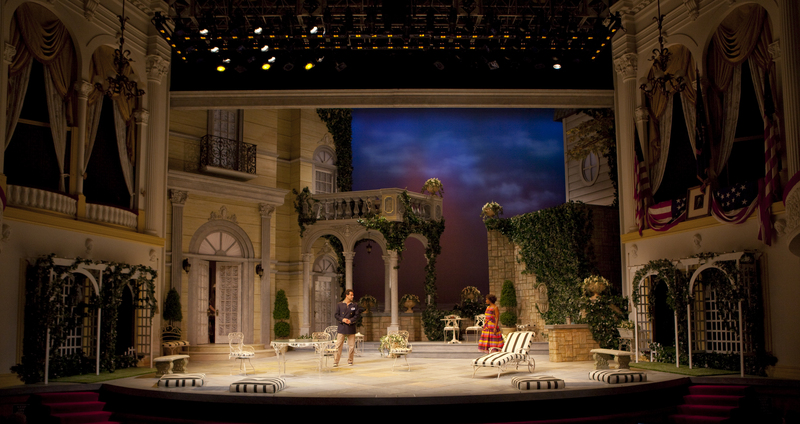 Many stage directors choose to utilize the boxes in their production designs. The lower four boxes now often function as on-stage entrances and exits, or become part of the scenery. In the annual holiday classic A Christmas Carol¸ for instance, the boxes become London storefronts. In our 2012 production of Fly, large panels covered the lower boxes. Image from "Now He Belongs to the Ages" at Ford's on April 15, 2015. Photo by James R. Brantley. The upper boxes remain untouched. Occasionally directors of productions that speak to the history of Lincoln or the Civil War will have actors look to the box to acknowledge the legacy symbolized therein. 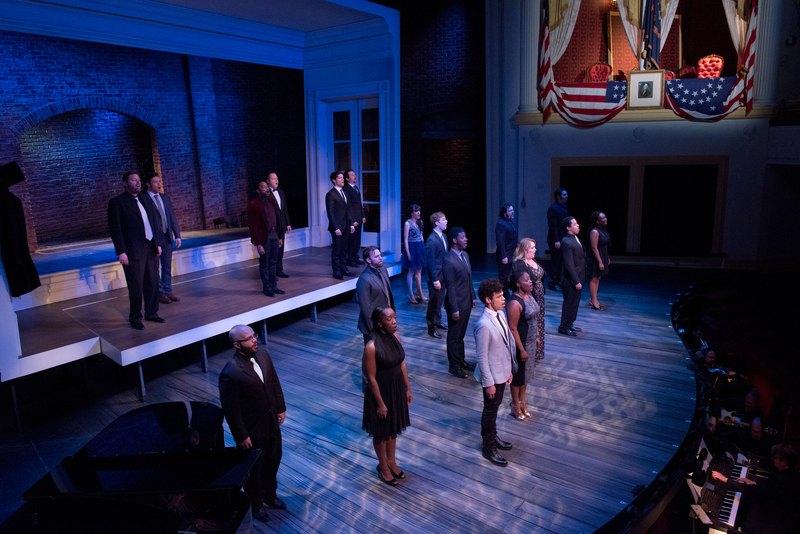 For example, in our commemorative event for the 150th anniversary of Lincoln’s assassination, Now He Belongs to the Ages, the ensemble looked up to the Presidential Box, lit from within, during a moment of silence. To learn more about the Presidential Box, we recommend reading Images of America: Ford’s Theatre, Ford’s Theatre and the Lincoln Assassination, and the 1963 Ford’s Theatre Historic Structures Report (available online). Sara Cohen is former Marketing Manager at Ford’s Theatre.